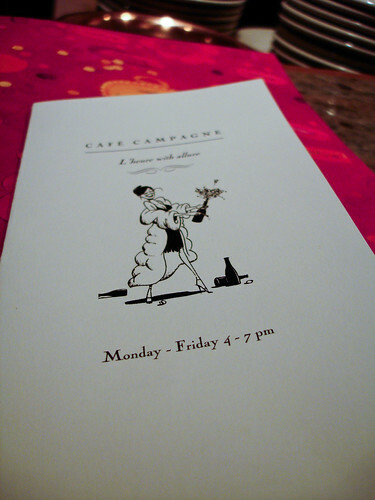 About the same time that Cafe Campagne started offering take out cassoulet last fall, they also added Happy Hour. With the holidays I hadn’t been able to try it out but finally got to it earlier this week. And boy, do I wish I’d tried it sooner! Then again, maybe it was good I didn’t. M and I met there at 5:00 on Tuesday. When I arrived, a couple of tables were occupied, one with a group of senior citizens enjoying a late afternoon glass of wine and sharing laughs, another with a retired couple and what can only be presumed to be their grandchild. But before M arrived promptly at 5:00 (I’d arrived a few minutes earlier) they had paid their checks and exited into the crisp winter air leaving the bar quiet except for the staff skittering around preparing for the evening guests. When I sat down at the bar a tall, thin (truly) French server brought me menus and then took my order for a glass of Grenache-Syrah, an interesting, fruity-at-first, settling into rather lush wine. As the clock approached 5:00 another server turned down the lights, looking at me for approval – was that better? Certainly cozier, warmer feeling but at this time of year when I crave the light I couldn’t quite say it was better – although it was a much more proper feel for a French bistro. I perused the menu, sipped my wine, made notes of things I needed to do and listened to the pleasant banter of the staff as they enjoyed the quiet. When M arrived and had ordered her wine – she chose the same thing I had – we decided on a couple of menu items and then relaxed and chatted while waiting for them to arrive. First out was a plate of gougere – a traditional French nibble which is basically a cheese puff. I make these at home quiet often and always try them when out and about to see if I can find an offering that matches what I make. I finally found it on this night. Perfectly light and hollow on the inside; moist and just a bit gooey from the Gruyere cheese. My only wish was that they had warmed them a bit. Still, they were very good and now I am inspired to make more! Soon after a dish of duck and pork rillettes arived. The rillettes were very good however they were topped with coarse salt and that was a little overpowering. We ended up scraping most of it off so that we could actually taste the meat. Served with slices of baguette, cornichon and mustard it was one of those fun dishes that you can arrange to your own personal liking. During Happy Hour wine is $6 per glass, and the petits plats are $5. A very good deal indeed! By the time we left a couple other tables were filled with happily sipping, munching friends but still the tables were mostly empty. This may have been partially due to the snow we’d received overnight the previous night – it did seem as though downtown was much quieter than usual. I think, however, that people have not yet discovered that this tucked away Seattle gem is offering such a great after work deal. You should get down there before it’s widely known and finding a place to sit becomes impossible! That\’s a great point, Eric. It\’s normally bustling enough that you get that out and about feeling without feeling like you are out of place on your own. What a great design on the menu. Perfect!Wonderful description of your experience. Super photos.I want to move to Seattle! I need to check this place out more often…both "live spaces" and Cafe Campagne. I ended up there a few nights back i.e. last week and it ROCKED. We had the full dinner experience, but it was really, really…really good. Steak tar tar, poison de jour, chevre salad.excellent. will be back. urbanspoon.com threw me back here. 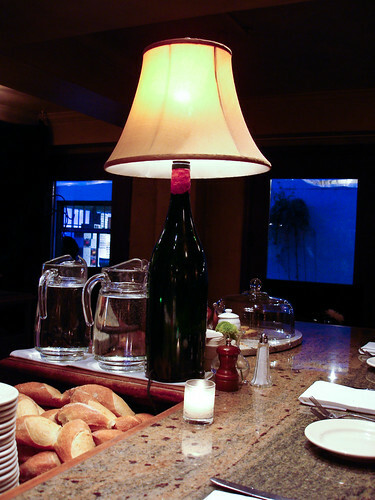 Cafe Campagne is definitley one of my faves – try the lamb burger sometime. And Urbanspoon is a great resource!